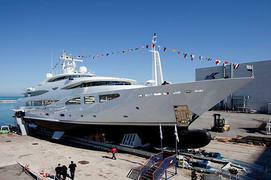 Last week saw the launch of of the fifth 60 metre yacht from the CRN yard in Ancona. Named Mimtee, the exterior was designed by Zuccon International, while Laura Sessa Romboli was responsible for this superyacht's interior design. Accommodating 12 guests in a master and five double cabins, Mimtee has a cruising speed of 14 knots.